In my classroom one of the many things that I want for my kidlets, is for them to feel creative. I want them to be artists. So, one of my tasks is to provide inspiration and materials. Sometimes that rolls into one. 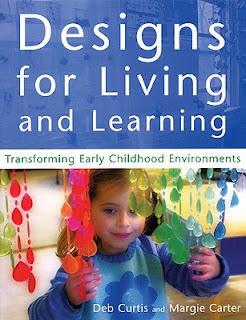 When I am looking for ideas and inspiration how to make my classroom environment inviting and an integral part of my students' leaning (Reggio Emilia's third teacher), my go to resource is Designs for Living and Learning by Deb Curtis and Margie Carter. 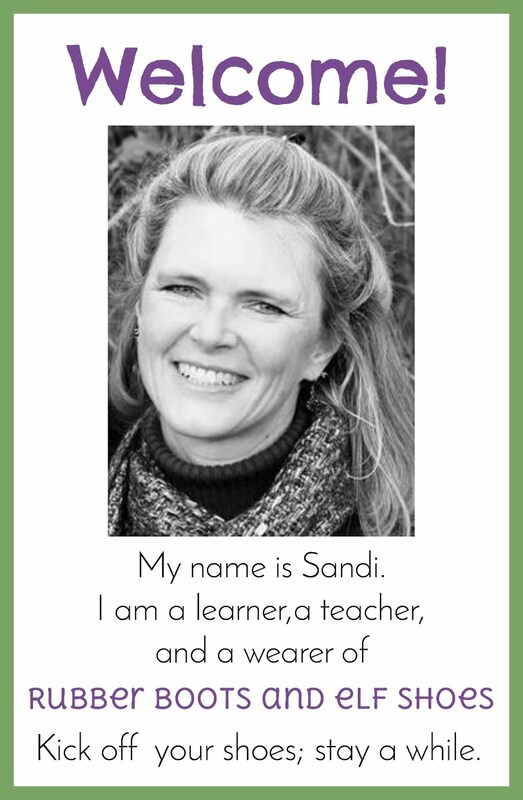 It is a fabulous resources that never fails to both challenge and inspire me. They show and discuss learning spaces that are set up so that art materials are available to the children, and are arranged beautifully. 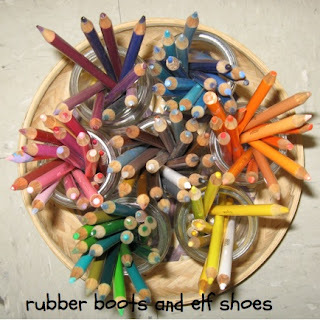 I don't have an atelier (workshop in a Reggio school), but I can arrange pencil crayons so that they invite creativity. 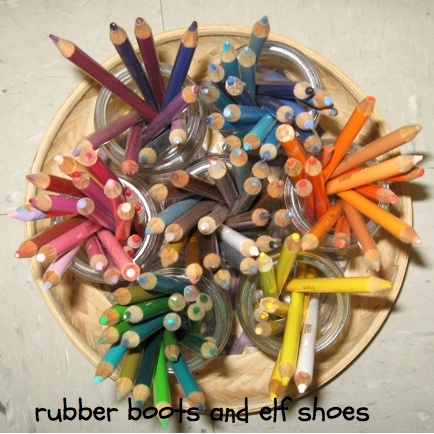 We have shared crayons in regular old pencil boxes. But when someone wants to be an artist, to think about shades of colour, they very carefully carry the artists pencils to where they want to create. And if they want paper, they can take it from the paper bins. 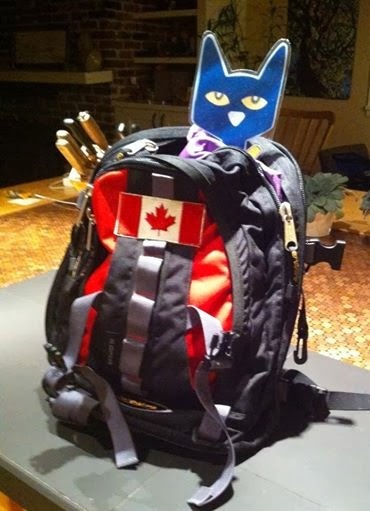 With readily available materials, the kidlets can create with intention. Whatever colour you choose, it's all good. we moved into our new school this past January and I used Curtis and Carter`s book as a great reference. I would love to see your room one day Maureen. Field Trip! That would be awesome to tour each others rooms. I find it very inspirational to see how other teachers/facilitators use their space and equipment to meet the needs of their families and students. That book looks really interesting. I just pinned it! Hello :) I'm your newest follower..I'm excited to hear about your adventures in Kindergarten..and thank you for the book recommendation..
Hi! 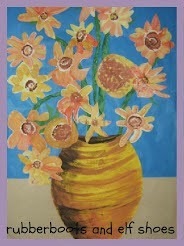 Thanks for coming by and following my blog, I am returning the favor. This is a beautiful idea. 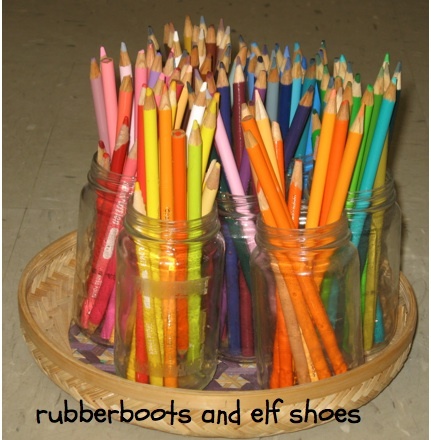 I have been thinking I need new crayon baskets for my classroom where we do shared supplies, I might have to try this sort of arrangement! I nominated you for a bloggin award! Check it out on my blog to grab it! I came over from Miss Night's post about coloured pencils to see how you did yours - love the idea of using the old jars for the containers, but my favourite thing is the paper box file stor<ge things for the coloured paper, I have small bits chopped ready in tubs but couldn't figure out how to put out bigger pieces ready for them to cut/draw/fold etc. without it ending up a tip!